The focus of this weblog is on applying emotional intelligence to project management. Frankly I feel a little torn about the amount of theory to include here. My preference is to simply jump into the application. However, I believe that some understanding of some relevant theory would be helpful to project managers as they try to apply emotional intelligence. 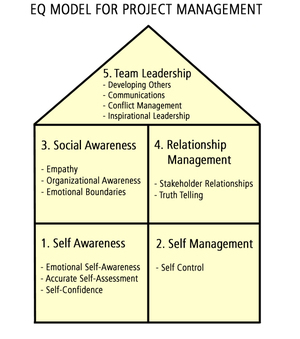 In particular, understanding a framework for Emotional Intelligence will be helpful in applying it to project management. As noted in a previous post, What is Emotional Intelligence, there are two main groups of researchers on Emotional Intelligence. The first camp was Peter Salovey and John Mayer (and later David Caruso) who first coined the term Emotional Intelligence in their published paper of the same title. The second camp was started by Daniel Goleman. This second group now includes 7 other researchers and is called the Consortium for Research on Emotional Intelligence in Organizations. There is considerable controversy between the two camps which surprised me since I thought the research community was above that sort of thing. By comparison, the controversy isn’t nearly as interesting as what you might find on a typical reality TV show. The acrimony, blame, and finger pointing that goes on in the board room of The Apprentice is considerably more charged than what you will find here. Speaking of The Apprentice, how about the vote that Donald Trump received for thought leader on Project Management? But I digress. 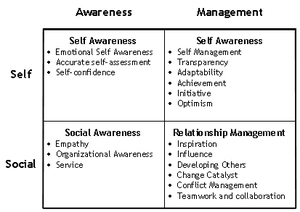 As you can see, the model builds on Goleman’s 2×2 framework for the various competencies. I have dropped several of the competencies less important to project management like Transparency, Achievement, and Change Catalyst. I also created a separate category for Team Leadership and moved several competencies into that. This is the model I use for project management and one that will be referenced in this blog. Applied EQ #6: What are emotions?